This interview was held at Ms. Steven’s office at the Metropolitan Opera in New York. Article and photo copyright ©1988, 2005, all rights reserved. Excerpted from Issue #36 of Mac/Eddy Today. 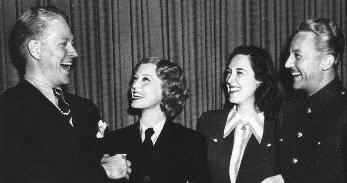 The photo is a candid taken in 1941 while Nelson and Rise were filming The Chocolate Soldier, and Jeanette and Gene Raymond were filming Smilin’ Through. Note that Jeanette stands next to Nelson, not her husband. She didn’t visit The Chocolate Soldier set but Nelson appears in several candids on her set when Jeanette is in costume. Sharon Rich: Tell me about The Chocolate Soldier. Nelson once said it was his favorite film, acting-wise. The reviews were generally good, no snide comments on his being wooden, and some complemented his flair for comedy. SR: How was the director to work with? SR: Did he have a heavy hand? RS: As I recall, I don’t think he was very effective. SR: Tell me about Nelson. RS: He was friends with Clark Gable. He asked me to lunch one afternoon, and took me to the commissary. There was Gable and Judy Garland, and he took me over to Gable to introduce me to him. SR: So, at that time, Jeanette and Nelson had had some kind of professional breakup? RS: Yes, I guess so….I did question it at the time, that’s how I found out there was something wrong. He wanted very much to make the film with her. The same thing happened with Balalaika, if you recall. That was Ilona Massey. SR: Did you know anything about Jeanette and Nelson’s off-screen relationship? RS: No. See, I came at a phase of his life where—well, maybe he just didn’t talk about things like that. Let me ask you, did they have a romance? SR: Yes. Why do you ask? RS: I heard about it at the time, and when I met Jeanette, there was a slight friction there, like “hands off, he’s mine.” I was unaware of what it was at the time, just that she was nervous about Nelson working with me. SR: In researching, I hear contradictory stories about you and Nelson….Which is why I wanted to interview you directly. SR: Nelson’s home, you mean? RS: Yes, the whole house. It was newly built for Ann and him. He had invited us for dinner. And all of a sudden this cute little poodle comes running up and he was so darling, I fell in love with that poodle. Ann started complaining; she didn’t want the poodle because of all the white rugs; it was staining all the rugs, and she was furious, just furious. I said “Fine, I’ll take it!” And with that, Nelson handed me the poodle and I went home with my first dog that I ever had! Click here to read other articles.